WASHINGTON (AP) — This week's midterm elections offered revealing lessons for both parties as battle lines begin to emerge for the 2020 presidential election. For Democrats, a string of statewide victories in Rust Belt states opened a potential path back to the White House. But President Donald Trump's Republican Party found strength in critical states that often hold the keys to the presidency. Perhaps no state offered Democrats more hope than Wisconsin, which shocked the party in 2016 by narrowly falling into Trump's column. Republican Gov. Scott Walker's narrow loss in his bid for a third term left Democrats optimistic they could reclaim Wisconsin along with other traditionally blue states that Trump carried, such as Michigan and Pennsylvania. "To have Walker lose is a significant turning point that the right candidate in 2020 could win all of these states" across the industrial north, Democratic pollster Paul Maslin, who advised Democratic Sen. Tammy Baldwin's campaign. "If they do, Trump's map starts to get more difficult." Still, there are plenty of reasons for caution for Democrats. Gains in Wisconsin, Michigan and Pennsylvania were offset by mixed results in Ohio and GOP dominance in electoral powerhouse Florida. In Ohio, Republicans came out on top in the governor's race and a handful of other statewide offices. The GOP kept their 12-4 majority in the U.S. House delegation. Ohio Democratic Rep. Tim Ryan, who won another term representing a district that Hillary Clinton won in 2016, called it a "really bad election night" for his party. But he said Democrats were able to win when they focused on "bread-and-butter economic issues," the way he and Sen. Sherrod Brown, who also won re-election Tuesday, did. "If you're not connecting with the workers, then you're not going to be able to do well," Ryan said in an interview. "Trump connected to the workers. If we don't do that, if we're continuing to be seen as elite and that people are 'deplorables' if they don't vote for us, we're going to have a big problem." In his victory speech, Brown said his state had provided a "blueprint for America in 2020." Republicans, though, pointed to Trump's 8-point victory in Ohio in 2016, and the four campaign visits he made to the state, including a southwest Ohio jaunt three weeks before the election. Trump remains very popular in the region, spanning from the politically swing-voting Hamilton County eastward along a string of Ohio River counties that the president carried by more than 30 percentage points. The area's white and vastly rural profile outside Cincinnati is part of what is expected to keep Ohio from springing back easily for Democrats, Hamilton County Republican Chairman Alex Triantafilou said. "I think southwest Ohio is becoming more reliably red under President Trump," Triantafilou said. "There's definitely a turnout benefit to talking to conservatives the way Trump has." There were also warning signs for Democrats in Florida, a perennial swing state that is increasingly delivering victories — however narrow — to the GOP. 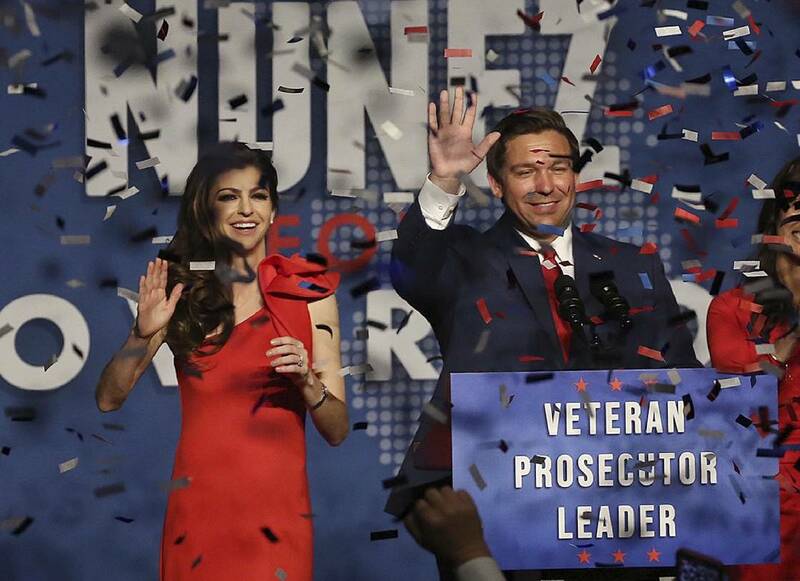 Republican Ron DeSantis defeated Tallahassee Mayor Andrew Gillum, handing Democrats their third consecutive loss for the Florida governor's mansion. Adding to their trouble was incumbent Democratic Sen. Bill Nelson trailing Republican Rick Scott. One bright note for Democrats in Florida was the passage of Amendment 4, which will restore voting rights to most felons when they complete their sentences and probation, adding 1.4 million possible voters to the rolls. It's unclear how this group of people will affect the 2020 election. Democrats also see bright signs in places like Nevada, once a conservative state that is now more consistently trending blue. Beto O'Rourke's Democratic campaign for Senate in Texas fell short by less than 3 percentage points in Texas, a GOP-heavy state that hasn't elected a Democrat to statewide office since 1994. And Democrat Stacey Abrams ran a competitive campaign for governor in Georgia, which hasn't elected a Democrat to the governor's mansion since 1998. "There are some assumptions about states Democratic presidential candidates will visit that are being truly reconsidered," Democratic strategist Anita Dunn said. "I'm talking about changing the map." Tensions were already flaring over what type of candidate could capitalize on the emerging 2020 map. "We're going to see a huge field, but the big question will be whether they learn lessons from the midterms because I think the electorate was trying to tell us something loudly and clearly," Matt Bennett of Third Way, a centrist think tank, said in an interview. "The message they were trying to send us is you've got to beat Trump in the battleground states, and you've got to run on very mainstream, nonextreme Democratic ideals and values." "The people that ran that way won in those tough places," Bennett added, "and the people who didn't run that way lost almost everywhere." But Adam Green, a co-founder of the Progressive Change Campaign Committee, said he saw a shifting center of gravity within the Democratic Party. "Thanks to Stacey Abrams, Andrew Gillum and Beto O'Rourke, places where Democrats have had trouble winning for years became unpredictable toss-ups in large part because of an electorate inspired by never-before-heard bold visions for economic and racial justice," Green said.